The Garmin Edge 520 is the GPS bike computer that’s right-sized for competitive cyclists and packed with the features you crave. Garmin started with the aerodynamic form factor of the popular Edge 500, added in-ride challenges on Strava live segments, colour display, connected capabilities and advanced analysis features. The result — the Edge 520, the GPS bike computer that helps you compete, compare and enhance your performance. The Garmin Edge 520 is the first bike computer that’s compatible with Strava live segments and includes a 3-month trial of Strava Premium. 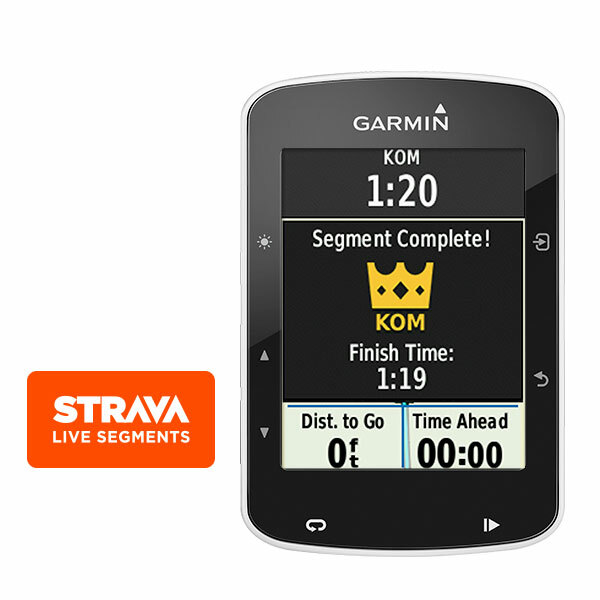 With this membership, your starred Strava segments automatically sync with the 520 for live feedback during your ride. You’ll also get alerts for segment start and finish and leaderboard rankings once you complete the segment. Pair it with a power meter and Edge 520 offers an additional set of features, like FTP and watts/kg tracking, so you can compare yourself to others, as well as cycling dynamics². A built-in FTP test helps you establish your baseline either on the trainer or on the road. Using your included heart rate monitor, the Edge 520 can derive your VO2 max estimate and post-ride recovery time, which indicates how long before you should attempt another hard effort. Edge 520 compromises nothing when it comes to display — 2.3 inches of high-resolution colour. We maximized the display so you get the most live area in relation to the compact size of the 520. You’ll also appreciate the screen clarity in all lighting conditions. Edge 520 is compatible with ANT+ sensors, including Varia™ bike radar and lights4, speed, cadence (included), heart rate (included), Edge and VIRB® remotes and compatible weight scales. It also integrates with Shimano Di2 electronic shifting systems5 to display your current gear on the screen. Edge 520 is also compatible with ANT+ power meters, including the Vector series. Is your phone not listed? Garmin will attempt to keep this list up to date with the most popular Smartphones that feature Bluetooth Smart technology however it will be possible that a particular model may exist and appear to work but not be listed as compatible. Garmin Connect Mobile is not compatible with Windows OS phones. If you are not sure or have questions about your phone’s specifications please consult with your wireless provider or phone manufacturer. Please Note: These products are compatible with Garmin Varia Radar. A software update may be required for this new feature to become enabled. Great product! Pairs well with my sensors and powertap P1 pedals with zero issues. Perfect size to fit on either the stem or out front with the two types of mounts. Only wished the screen was a bit brighter and that buttons were at the bottom instead of the side. But that’s nitpicking. Certainly have not had any issues with this product at all. Quite happy with this item and great piece of kit to add if you’re an avid cyclist without breaking the bank. User friendly! Love the actual button rather than touch screen. You guys rock, excellent service. Delivered to SA in less than 6 days. Excellent prices and service. Will defiantly be using you guys again and recommending. Almost forgot, the Garmin edge 520, lives up to all the reviews I read before purchasing..